So every now and then something incredible happens. We have been so busy. Getting a food blog done each night has been a bit of a stretch this last week and today we were feeling fairly tapped out….and then as if it were meant to be….inspiration! One of us is a huge (HUGE) dance history geek. 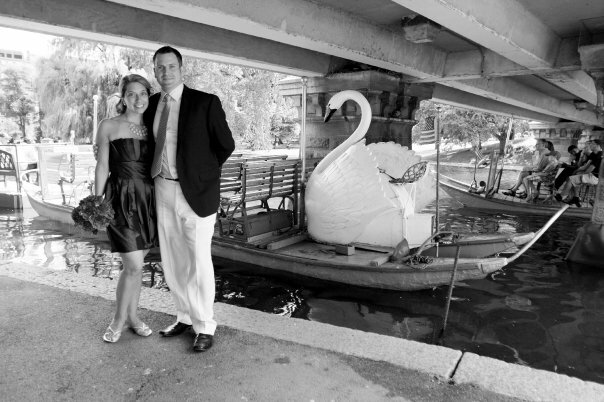 We were spending an amazing day in Becket, Massachusetts at the magical location known as Jacob’s Pillow. We were there to see dance. Never did we expect to hear this marvelous story about food. He told the story of the end of last summer. While he was talking other people were dancing around him, but to be honest, our attention was on his story. One of us happens to LOVE Mark Morris. His dancers, his choreography, his everything…it is just a magical fact that we share the same birthday, August 29, and in my mind that somehow connects us. If you don’t know who he is you should check him out. So ok, there sat this dancer from the company talking about the last show of the season last year at Jacob’s Pillow being cancelled due to Hurricane Irene. So the dancers were not going to be able to perform. A real let down if you are in a dance company and excited to perform the last show of a season at a dance mecca such as The Pillow…but what can you do? Mother nature won out…the members of the company had another idea. They would have a food challenge. A la Food Network. They split into teams. They were going to have a meatball challenge. His story was hilarious and we are not doing it justice. But he talked about this meatball challenge and how his team ventured out in the hurricane to the gourmet market in town and purchased the items they needed to make their meatballs with their secret ingredient being duck liver pate. His competitors travelled to the average market and, in his words, had lots of secret ingredients…all we heard though was duck liver pate…in a meatball! Brilliant. We couldn’t get to the market fast enough. 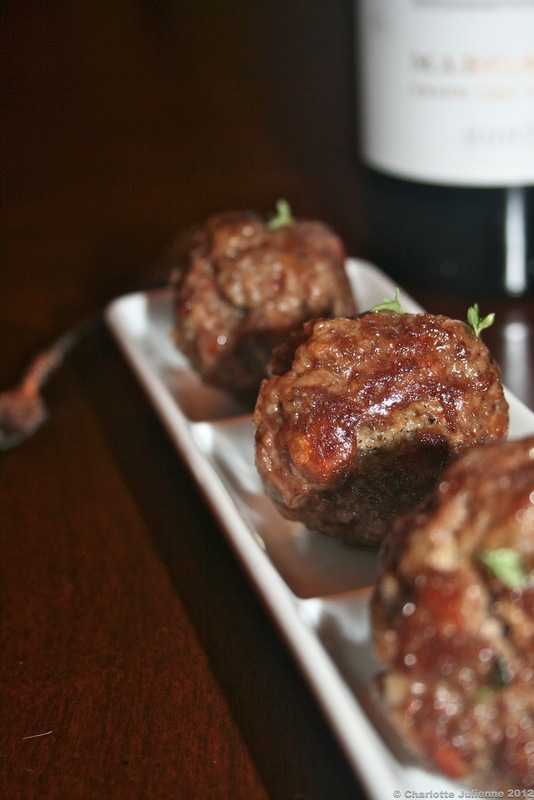 We made our own meatball recipe, as you could as well. 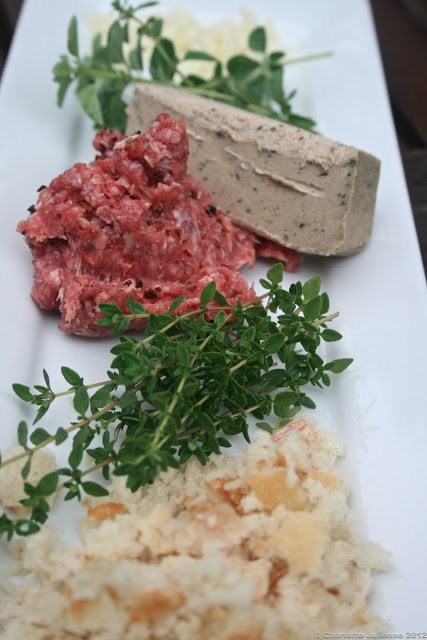 Ours consisted of ground beef, garlic, thyme, oregano, breadcrumbs, an egg, salt, pepper and then the duck liver pate. 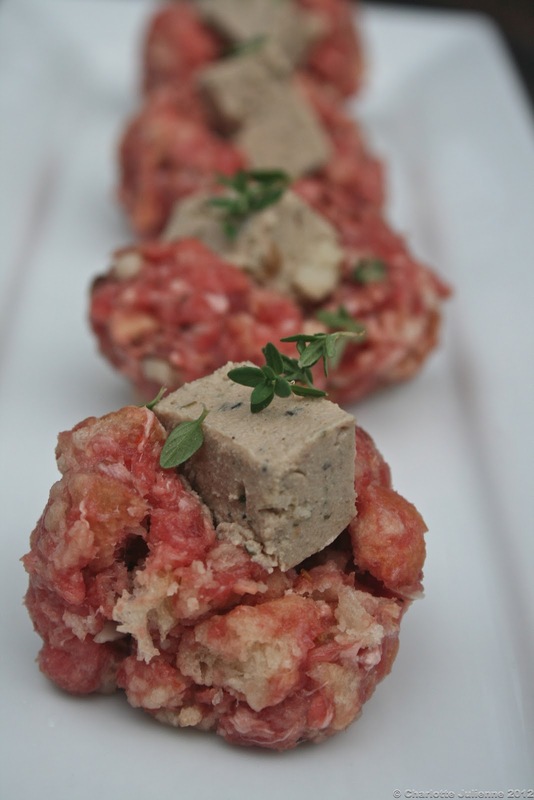 The pate was stuck into the center of each meatball and then more meat was added to the top and the balls were shaped. The balls were browned on each side and then placed in a 350 oven for about 30 minutes. Ok. The end of his story…his team didn’t win. The dancers found themselves in the middle of a pretty significant hurricane and were cooking, eating and drinking. They ended up taking their clothing off, going outside in the midst of the rain, which was falling horizontally, and dancing, full out. Just another reason to love this dance group. The meatballs should have won. They were AMAZING. We are not meatball people. 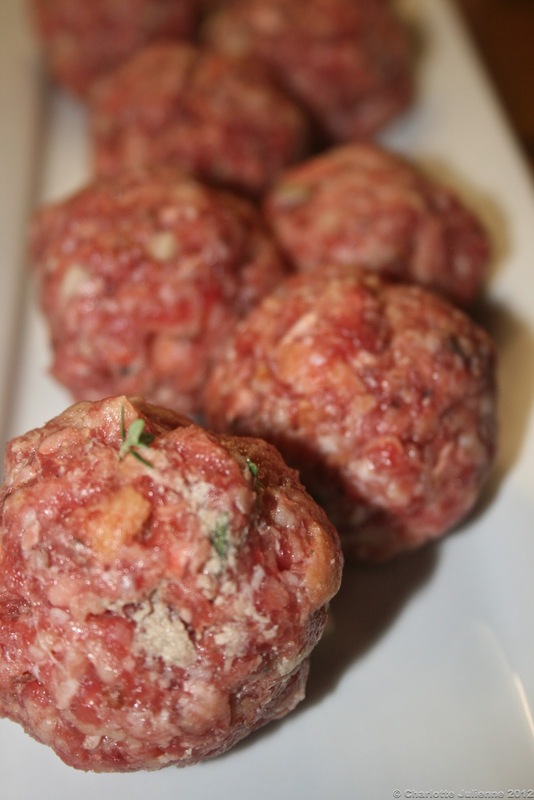 They are usually too dry and we don’t eat a lot of pasta and hence we don’t eat a lot of meatballs. These however…so yummy! The duck liver pate added a depth of flavor that we had not experienced before. Bravo John Heginbotham. We loved your story. And we love your meatballs!